Archespore is a Creature/Monster in The Witcher 3: Wild Hunt. "Archespores look like gigantic, aesthetically unpleasing flowers with some of the traits of exceptionally cruel and bloodthirsty sundews. 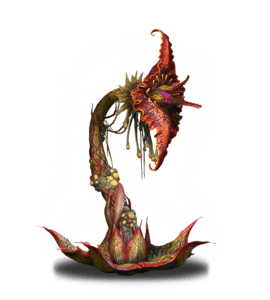 They are, however, far more dangerous that even the most colossal sundew. Their peculiar appearance makes them practically impossible to discern amidsts other plants. By the time one draws close enough to realize what they are, it is often too late to flee. According to popular belief, archespores are cursed plants grown in soil fertilized by the blood of the dying. They are most often found in places which in the past saw pogroms, bloody rituals or cruel murders Four types of archespore have been catalogued to date, differing from one another in terms of coloring: brown (the least dangerous), green and purple (the most dangerous). The final variant, said to have been cultivated by ages from Ban Ard, is the yellow archespore, whose strength is similar to that of its green-colored-cousins. Regardless of color, all archespores fight using similar methods: attacking with powerful, jaw-like leaves. If their victim is out of reach, they can also spray caustic acid which if it makes any contact whatsoever with the skin, can provoke a reaction similar to that caused by severe poisoning. Like other plants, all archespores are extremely vulnerable to fire, which is one of the most effective methods of fighting them. Silver also works well, as does any sort of shock wave. Archespores do not like strong vibrations, which cause them to flee underground at once. Due to the nature of their origins, oil damaging to cursed beings can also be useful against them." Attacks: Shoots an energy-sapping substance that also damages. Ranged attacks and pod-bombs that explode with poison. Igni is not terribly effective against the Archespores because they will quickly submerge, canceling the burning. Golden Oriole can really turn the tables on them as their spit and poison then heals you. Pod explosions do not inflict Poison damage. Archespores summon mutiple pods which serve as bombs and possible spawning points. You should never attack the pods with melee strikes.